June 2019 marks our eighth summer running Kaytanat Ivrit, our Hebrew language immersion day camp. Our camp encompasses all the typical activities of a regular day camp, but in an immersive, Hebrew environment. Hebrew camp is open to campers with any level of Hebrew background. 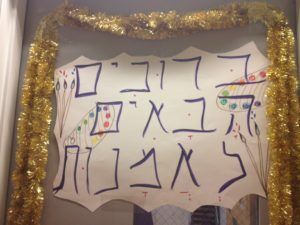 We have campers who learn their very first Hebrew words with us and campers who come from Hebrew-speaking homes. Our excellent staff and flexible program adapt to meet each child’s needs. In contrast to the school setting where students’ attention is divided among many subjects, children at camp are better able to absorb Hebrew throughout their day. All activities are conducted entirely in Hebrew by our native Israeli and Hebrew-speaking staff. 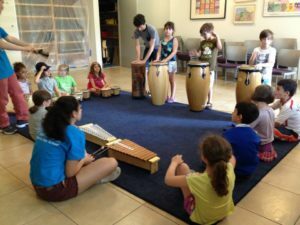 Israeli culture is infused throughout the program through songs, games, science, cooking, Israeli scouting, and language. Whether painting in art class or playing in the gym, campers are constantly exposed to Hebrew vocabulary. Campers are encouraged to speak Hebrew as much as possible throughout the day, both with the staff and with each other. Above all, we strive to create a safe, fun-filled environment, where children feel comfortable learning and expressing themselves in Hebrew. Camp begins between 8:30 AM and 9:00 AM and ends at 3:00 PM, with extended care available until 5:00 PM. Each day begins and ends with community gatherings. A typical day will include outdoor physical activity and programming in arts and Israeli culture. Campers are required to bring a snack and a packed lunch (dairy or pareve) every day. At the end of the day, each group visits the makolet (canteen), where they “purchase” a small treat using sh’kalim (pretend Israeli currency.) 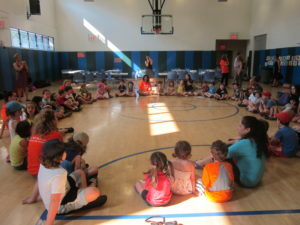 The makolet, run by our oldest campers, serves as an excellent opportunity for children to use Hebrew with each other. Campers will take one trip during the second week of camp. Past trips have been to the zoo, roller-skating, Pier 6, and mini-golf. Ages: Children entering K-entering eighth grade. Camp is open to both Senesh and non- Senesh students. Extended Care: Available daily from 3:00 pm -5:00 pm. $125 for the Full Program, or $20 a day. 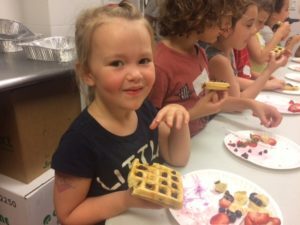 Camp offers a unique opportunity for incoming Kindergarten students to become familiar with the Hannah Senesh environment and meet new friends and teachers in a fun, low-pressure setting – this helps ease the transition into Kindergarten. Hebrew camp offers our oldest campers a chance to take on a leadership role, both linguistically and socially. Our oldest campers set the tone for camp activities including morning singing, lunch, recess, and trips. They serve as older buddies to our youngest campers and also run our makolet (shop), which involves designing and organizing the store, setting prices, and interacting verbally with all the other campers on a daily basis. Hebrew Camp is staffed by native Hebrew speakers who teach Hebrew at Senesh during the academic year. Our staff have years of experience and training in Hebrew instruction. Our professional teaching team is supported by outside staff and Shinshinim (emissaries from the Jewish Agency) from the community. Shira helped develop and launch the Hebrew camp and has been director since its inception in 2001. During the academic year, Shira teaches second grade Hebrew and Judaic Studies at Hannah Senesh. 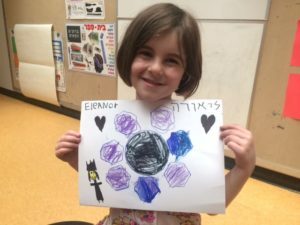 Her favorite part of camp is creating and experiencing the unique Hebrew immersion atmosphere. For any questions regarding camp please do not hesitate to contact Shira at sbecher@hannahsenesh.org. 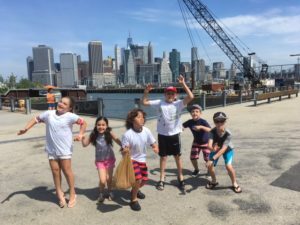 Hebrew camp takes place at the Hannah Senesh School in Carroll Gardens, Brooklyn. The building has a large gym, kosher kitchen, art room, and music room with instruments. Each group has its own home-base classroom, equipped with an Eno board, art supplies, and Hebrew games and books. 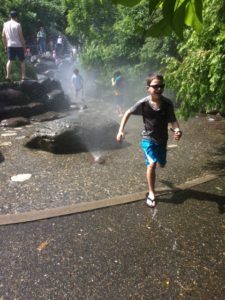 We are located a block from Carroll Park where we enjoy daily outdoor time and play in the sprinklers.